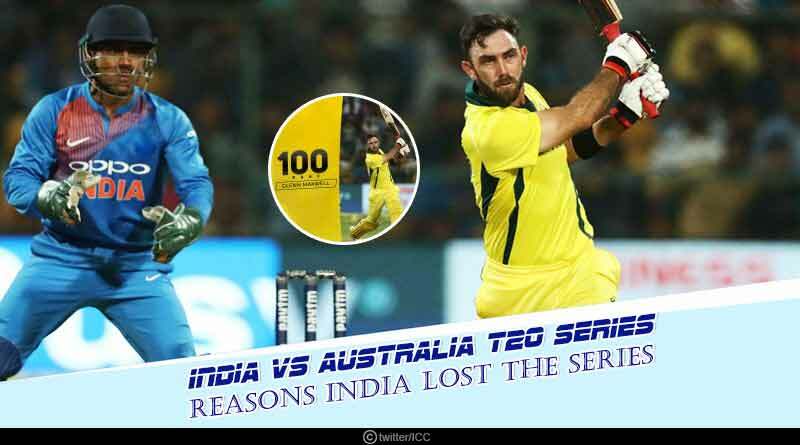 Do you know the Reasons why India lost India Vs Australia T20 Series? Falling 2-0 to Australia in the two-match T20 series, India was left disappointed with its performance during the series. It was not the defeat but rather the way the side lost, putting in two underwhelming performances with the ball that has left us with an unsavory taste. The hosts were completely outplayed in all there departments of the game, with the Australians out-batting, out-bowling and out-fielding India with such relative ease that has left us with many talking points in the culmination of the series. “Australia outplayed us in all departments and deserved to win. 190 is a good total on most grounds but if there is so much dew as there was tonight and when you have an innings like what Maxwell played, nothing much you can do,” Kohli said. Looking to try out new players, one they have an eye on for the world cup berths, India throughout the series fielded players who haven’t been awarded much playing time recently. Unfortunately for them, these selections failed to justify the trust reposed in them, with not even one fringe player turning up when it mattered the most. What hurt the side most throughout the series was the lack of a proper 2nd and 3rd pacer with Bumrah having to wage a lone fight in both the matches for the country. This paired with Chahal being extremely poor allowed Australia to easily peel off the runs in both the chases, leaving India to face the results of the dwindling showings. “Every team is looking to take each game like that but it’s also important to win matches. We would have liked to get across the line in at least this game but I can’t be too hard on the bowlers due to the amount of dew,” the Indian skipper said. “We wanted to give everyone some game time, we’ve seen how they react under pressure, there is a series coming up and we’ll try more things. It’s up to them to deliver the goods,” he added. With spearheads Bhuvneshwar and Shami both given some much needed hectic time with the BCCI looking to ensure that its main pacers went into the tournament fully fit, Umesh, Shankar and Kaul were given chances for the country. It proved to be a wrong decision for the side though with neither of them impressing enough, failed to hit the pitch in the right areas. Their bowling was one of the main reasons India lost the series with the Australian middle-order finding it too easy to pummel them. While Umesh gave away a massive 14 runs in the last over of the first ODI to single handily lose the match for India. Shankar gave away 38 in the second along with Kaul leaking an abysmal 45 runs in 3.4 overs. Time has certainly run out for these three with them failing despite multiple chances and it’s high time the BCCI decides to look at new faces to replace players who’ve underperformed on a regular basis. The spin department of India was completely non-functional. Chahal was plundered for runs in both the matches, while Mayank faced the same fate in the first T20 that he played in. In total, the spinners managed to pick up just 2 wickets in the series, with the second match seeing them being pummelled for 70 runs for no response. They allowed Australia to play out their game in the middle overs, allowing the middle-order to get into the groove and work the ball around as they liked. One big question that’s again come to the forefront after the end of this series is why Jadeja was excluded from this series. With India looking to try out new things, Jadeja warranted a call up to the side. He would have been a much better option than the ones India decided to go in with. Jadeja is more than capable of bowling good 4 overs of spin and at the bottom, he can swing his bat about with the tail to add important runs for the side. Especially with a good showing in England last year, one that was followed up in Australia, it is surprising to see why isn’t he being considered by the BCCI to represent the country on a more consistent basis. For more articles like ‘Reasons why India lost India Vs Australia T20 Series’ Do follow us on Facebook, Twitter and Google+.